Though rainy season is nigh, there’s still plenty of that sweet, sweet life-giving nectar to be squeezed out of the last few weeks of a sweltering Portland summer. While it’s often beer-flavored, a dash of chlorine from a long day of pool hangs (or growing a few extra toes after diving into the Willamette with reckless abandon) can be just what the doctor ordered to keep the seasonal affective disorder at bay for another month. 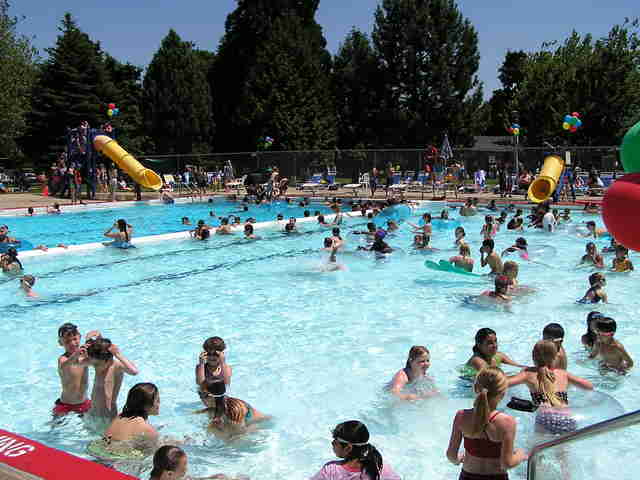 Whether or not city pools were your thing back when you were a kid is beside the point: just like riding the bus, taking advantage of municipal pools is a civic duty that totally normal people do. So lather on the Banana Boat, throw some La Croix in the cooler, and prepare to soak up those last remaining rays! Easily one of the most memorable buildings in Portland Parks & Rec’s portfolio, the poolhouse for this small-ish pool right on Rosa Parks looks more like something out of a Paul Thomas Anderson movie than it does a municipal building. But it has a waterslide and really cheap tacos at Javier's nearby, so we’ll take it! Though it’s not technically a suburb, Sellwood just oozes that kind of old-timey suburban charm that’s rare in newer ‘burbs like Tualatin and Tigard. 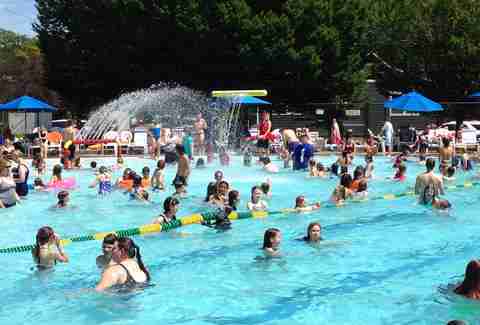 As such, its municipal pool -- a chilly throwback to the good old days before kids spent their free time chasing Pokemon -- is a real treat on a hot summer day. You know that one rare non-transplant friend of yours who grew up on the west side but always makes the point that they did NOT grow up in Beaverton? This was probably their go-to swim spot, and given the lazy river and the idyllic, woodsy environs that surround the entrance, it’s surely something they’re proud of. Situated at what’s essentially the end of St. John’s, i.e. 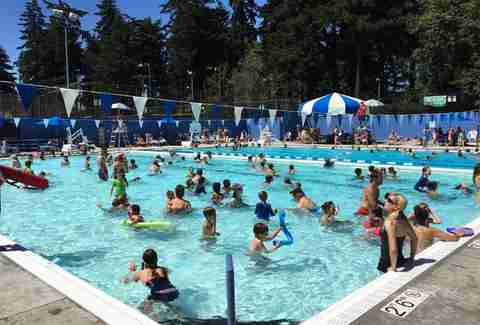 the edge of the known universe to the average Portlander, Pier Outdoor pool's location may make you more inclined to drive the extra 10 minutes just to admire the sandy shores of Kelley Point instead (swimming there is a no-no). But nothing washes away the sweat and flecks of concrete lodged in your knees from shredding the nearby skate park with your sickest Thrasher tee on quite like a dip in this pool. 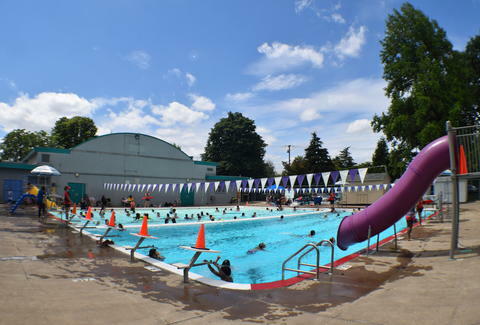 You’ve driven by the forested slope near Powell and 39th that leads to the Creston Pool a million times, but did you ever think to actually hop in the pool that’s tucked away back there? 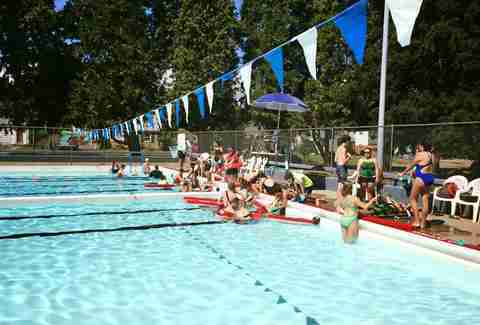 You should, because the combo of shady glades and sun-soaked grassy patches make this one of the city’s best municipal pools within striking distance of inner Portland. Bonus points for the Baskin-Robbins a couple blocks away! Deck space is limited at this pool in the middle of Grant Park, but the water is wet, and that’s all that really counts on a hot day, right? OK, so this pool is indoors, but anyone who’s lived here for more than a month knows that a 50% chance of rain no matter the season is just part of the deal. If you’ve been planning a chlorinated layabout for days and just happen to pick the one odd day in the summer that gets rained out, fear not: this snazzy community pool has something for everyone... besides sunlight, of course. But the tube slides totally make up for it. Pete Cottell is a belly-flop gold medalist and expert builder of Funnoodle™ flotillas who takes his summer pool time a bit too seriously. Follow his deckside adventures at @Vanifestdestiny.